My Little Paint Box: Halloween Challenge! It's Challenge time! 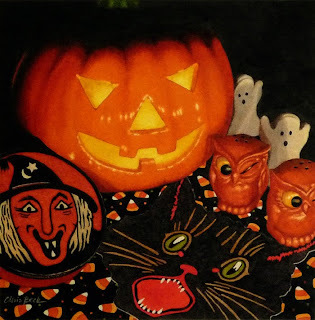 The wonderful Chris Beck and I just couldn't pass up a good challenge especially when it deals with whimsy, candy, wonderful artists, candy, a good theme, candy, painting some of our favorite trinkets, candy.. . .
Just love your painting, Pablo!! 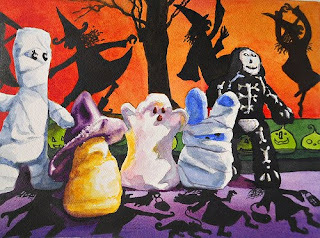 It's so much fun, with all the silhouettes and the mummified Easter peep!! Love all the color too!! Thanks Chris, this was a great challenge! Thanks to everyone for taking it on,loved every one of the images! Ha! I love how you brought the Peeps to Halloween. You're truly inspired and inspiring. Love this, Pablo! That mummy bunny is fantastic, and I love the silhouetted witches in the background! Thanks for including me in the challenge! Love the addition of the Peeps to the Halloween display - great painting and so creative and fun! Thanks to you and Chris for organizing and sharing all these works with us - really puts us in the Halloween spirir so now I have to go raid the candy bowl!! Fun fun fun! I'm so glad everyone is getting a kick out of this challenge (and my painting) Thank you everyone! Thanks again. In the words of the immortal Arthur/Dudley Moore. . . "Isn't fun the best thing to have!"